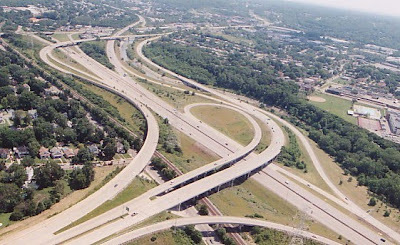 The U.S. Department of Transportation (DOT) has awarded a $712,500 grant to Cincinnati for the design of a new exit ramp on Interstate 75 at the existing Galbraith Road interchange. The project is a small component of the much larger multi-billion dollar effort to improve safety and add capacity to one of the nation's worst stretches of highway for commuters. The grant money will fund the elimination and replacement of the current left hand exit with a new right hand exit along northbound I-75. Project officials early on had suggested the elimination of the left hand Galbraith Road exit (map) altogether without a potential replacement. This proposal was met with great opposition from nearby residents and business owners who rely on the interstate access. “This project will make for an easier commute and improve safety on Interstate 75," said Representative Steve Driehaus (D-OH). "In addition, the funding will stimulate our local economy and create jobs." As an aside, I've long thought that here, in the shadows of 75/Cross County, a bike path along the Mill Creek would be an excellent addition. To my knowledge, current Mill Creek Restoration plans don't intend to reach this far north, but it would be great if the design for the highway reconfiguration allowed for easy future expansion of the proposed Mill Creek path.